Jean Renoir’s enduring classic, a comedy of manners with both a sharp satirical bite and a gracious spirit, almost never became the masterpiece it is today. 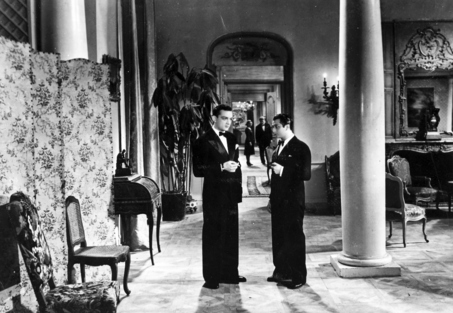 Like so many other great films, The Rules of the Game was misunderstood upon its initial release, cut to ribbons to appease contemporary tastes, and promptly abandoned and forgotten. It was reconstructed in 1959, and over the decades new audiences have appraised it with fresh eyes. Although perhaps the French public didn’t misunderstand the film at all back in 1939; perhaps they simply despised it for what they rightly perceived as a pointed indictment of the haughtiness, hypocrisy and tragic solipsism of the bourgeoisie, perilously retreating into their wealth as a great menace spreads across Europe. The Rules of the Game is a film of many dichotomies. Both in its form and content, it manages to embody distinct and opposing elements that deepen and enrich the film from their juxtaposition. First and foremost, Renoir patterns his ensemble of lovestruck characters around two sets of romantic triangles, setting into motion an upstairs/downstairs farce that foregrounds the distinctions between the elite and working class. This geometry brings the film’s bitter condemnation of the out-of-touch bourgeoisie into stark relief. And yet, in another of the film’s oxymoronic miracles, it shows an earnest and palpable warm-heartedness towards all its characters; contemptible as they may, Renoir, and subsequently the audience, finds humor and empathy in their follies. I can’t think of another film that communicates such serious social satire without malice and mean-spiritedness. A similar opposition exists within the aesthetics of the film, justly prized among the pinnacles of classical cinema. Renoir famously composed his frames in depth, allowing for crisscrossing planes of action to coexist within a single, extended take. This deep-focus cinematography, championed by Andre Bazin‘s influential school of film theory and advanced even further in the watershed Citizen Kane, both adds to the chaotic comedic energy of the film and provides a visual echo to its democratic scenario. Renoir’s strategy, as much political as it is visual, allows high and low class alike to share the same frame, generating new information from their placement and interaction therein. Marquises and servants alike are thrust together into the hallways of an opulent chalet, and within this ecosystem sparks fly. Running counter to the aesthetic philosophy advanced by Renoir’s use of deep focus, however, is a striking sequence driven not by the long take, but by assaultive and anachronistic montage. The scene comes as the houseguests assemble at the edge of the forest to hunt the game driven towards them by servants and dogs. In a barrage of bullets and cuts, rabbits and pheasants are cut down. Though the screenplay never calls attention to the cruelty, Renoir’s filmmaking does the talking: this is slaughter, not sport. While the tone of this sequence represents a sudden departure from the film’s overall lightheartedness, the metaphor here is potent and multivalent. Principally, it suggests the willingness of the upper class to sacrifice life for their own comfort and enjoyment, something the marquis’ attendants know all too well. However I think the hunting sequence is also meant to cast the film’s characters—both upper and lower class—as the unfortunate rabbits and pheasants. The war looms in the distance, and their insularity will leave the French as startled by its arrival as the game running for their lives. In yet another, more optimistic interpretation (which coexists perfectly with all the others), the characters simply become prey to love and each other’s affections. The film’s epigraph invokes Cupid, calling to mind the 18th and 19th century French comic theater that inspired Renoir, and with it obsessed and single-minded lovers embroiled in a great game. Renoir does a lot to tease this delightful spirit of aristocratic idyll out of the proceedings. Most crucially, he casts himself as Octave, a buffoonish Cupid character interfering to set the characters into motion around each other. By positioning the film within this comic and theatrical idiom, Renoir is able to soften the blow of his criticism: we may all be rabbits on the run (or mere cogs in one of the marquis’ elaborate mechanical contraptions), but our follies are guided by the purity and nobility of love. It’s not any one of these interpretations that makes The Rules of the Game a great film, but rather their proliferation. It’s cutting edge social satire as much as it is classical farce. Its characters are uniquely of its day, and yet timeless in their preoccupations. It blends techniques of deep focus and montage to express both a democratic optimism and an unsettling dread. Its tone is jovial and achingly tender in the same moment as it is bitter and sad. Indeed, The Rules of the Game is a film of many dichotomies, but the most beautiful and uniquely Renoir of them all is the grace to both express the courage of its convictions and recognize the humanity in the targets of its criticism. Thanks a lot, Paul, really appreciate it! And yeah, one of the best for sure.